Theresa May is being urged to stop MPs blocking a no-deal Brexit by the ‘nuclear option’ of dissolving Parliament while it takes place. The PM is on track for a catastrophic Commons defeat next week on the package she has thrashed out with Brussels – with attention already focusing on what happens next. 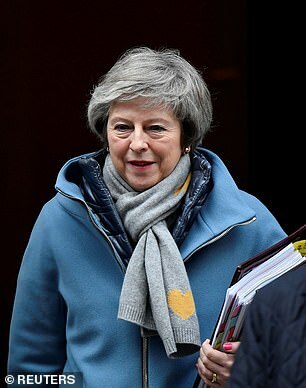 MailOnline understands she is under massive pressure from senior ministers to face down Tory rebels who are threatening to kill off the government in order to avoid crashing out of the EU. More than a dozen Conservatives MPs have made clear they would back a no-confidence vote and force an election if Mrs May tried to leave without an agreement in place. But Brexiteers are advising Mrs May to ensure the UK leaves in March by using her discretion to decide the date of any national vote – setting it for April 4. As there would be no sitting MPs on March 29 when the UK is due to leave the EU, they could not prevent the UK crashing out. In effect the scheme would mean Mrs May forcing no-deal Brexit, frustrating the resistance from cross-party Remainers. During the campaign the government would still be in place – and the civil service is allowed to continue implementing pre-existing policy. The move would spark a constitutional crisis, Cabinet resignations and leave MPs up in arms. But one Cabinet minister who supports the plan told MailOnline ignoring the will of Parliament would be justified to avoid ‘destroying the last bit of faith in politics’. ‘The public are saying, “just f***ing get on with it”,’ they said. ‘Failing to make Brexit happen would destroy the last bit of faith in politics. ‘It is either this deal or no deal, those are the only two choices. ‘If Tory Remainers threaten to join a no confidence vote, the PM should use her power to set the date of the election. Under the Fixed-term Parliaments Act, if a no-confidence motion is passed, there is a 14 day period in which the government – or a new administration – can try to establish a majority again. If a confidence motion is not passed by MPs during that time then an election is triggered. 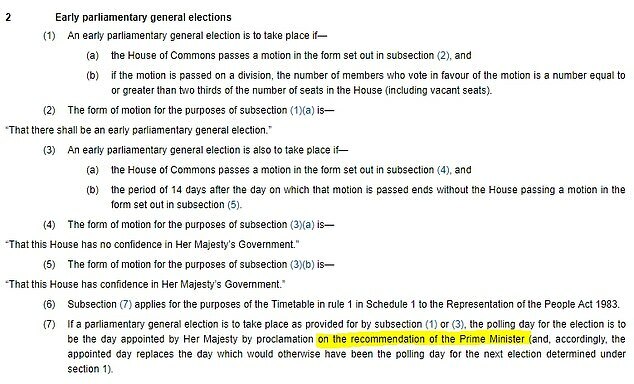 But the legislation sets out that the date of the national ballot will be ‘the day appointed by Her Majesty by proclamation on the recommendation of the Prime Minister’. The minister pointed out that, while Parliament is dissolved for 17 working days during a campaign, the government still exists, and the civil service can still carry out pre-existing policies. Asked what Mrs May should do if ministers opt to quit, they said: ‘Say bye bye. The Cabinet minister added that they believed Mrs May was committed to making Brexit happen. ‘The PM has not shown any signs of wavering so far,’ they said. A crucial Commons debate will resume later today on the Prime Minister’s blueprint – paving the way for a titanic showdown next week that could define the country’s future. But the walls are closing in on Mrs May after an alliance of Labour and Conservative rebels inflicted an historic defeat on the flagship Finance Bill – the first time that has happened for four decades. 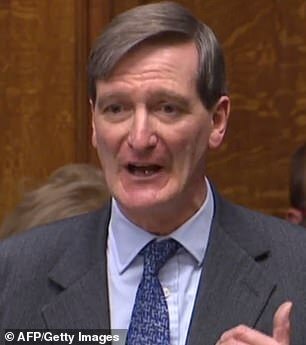 The amendment will curb the Treasury’s tax-raising powers if the government tries to force a no deal Brexit, with rebels insisting they will wage ‘guerrilla warfare’ to stop the UK crashing out without an agreement. 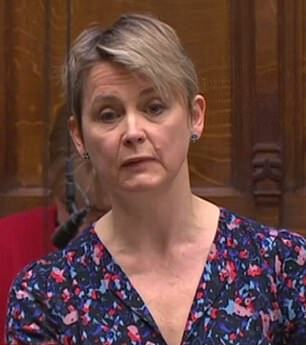 The Cabinet is also deeply split on how to proceed if Mrs May’s package is killed off, with figures such as Amber Rudd and Greg Clark adamant that no-deal should not be contemplated, while others such as Sajid Javid, Jeremy Hunt and Andrea Leadsom are thought to regard it as preferable to no Brexit. Mrs May – who has insisted she will not delay the Brexit date from the end of March – has effectively admitted the EU has not given her any new concessions by resuming the debate she delayed last month, rather than tabling a fresh motion.